Joy Womack in "Don Quixote." Photo by Kyoungjin Kim, Courtesy Universal Ballet. Joy Womack is no stranger to the road less traveled. As the first American graduate of the Bolshoi Ballet Academy and first American woman to join the Bolshoi Ballet, the California native is accustomed to going out on a limb. Now at 24, after spending last season as a principal dancer with the Universal Ballet in Seoul, South Korea, she is taking a leave of absence and is back in Moscow with a revamped perspective and an impressive bucket list. We caught up with Womack over the phone to hear about her move from Russia to Korea and back again, and how life has changed since venturing on her own. Some of ballet’s biggest stars have donated signed pointe shoes to raise money for victims of last April’s horrific earthquake in Nepal. The 7.8 magnitude earthquake killed over 9,000 people and left hundreds of thousands homeless. And while the disaster is no longer headline news, survivors are still desperate for help. From August 29 through September 13, Pointes for Nepal, an online campaign organized by Cloud & Victory dancewear, will be selling signed pointe shoes of ballerinas Diana Vishneva, Gillian Murphy, Maria Kochetkova, Isabella Boylston, Joy Womack, Michaela DePrince and more. While prices are steep (between $120 and $450 a pair), all proceeds benefit World Vision International and The Little Bells Promiseland Project, two charities providing aid relief to earthquake victims. This isn’t the first time dancers have come together to support Nepal. In June, the DRI Foundation hosted Dance for Nepal, a sold-out benefit that included performances by former American Ballet Theatre dancers Maxim Beloserkovsky and Irina Dvorovenko, New York City Ballet principals Sterling Hyltin and Amar Ramasar, and dancers from Martha Graham Dance Company, Paul Taylor’s American Modern Dance Company and more. The benefit raised $21,000 for the DRI Foundation Nepal Relief Fund. Womack rehearsing before the evening's performance of Don Quixote. Quinn Wharton for Pointe. A striking dancer with ultra-classical elegance, Joy Womack, who turns 21 in April, is the first American woman to graduate from the domestic program of the Bolshoi Ballet Academy in Moscow in over 60 years. She was immediately placed in the school's Russian classes, as opposed to its foreign program, which is unusual for an international student, and stayed for three years. After graduating in 2012, she joined the corps of the Bolshoi Ballet, but after a year and a half was invited into the smaller Kremlin Ballet as a principal. There, she was given the opportunity to dance Aurora and Giselle. Wendy Perron, editor at large of Dance Magazine, caught up with her by phone. Womack in front of the Kremlin on her morning walk to work. Joy Womack just signed a contract with the Bolshoi Ballet, becoming the first American woman ever to dance for the iconic Russian company. The historic move is especially significant because Joy wasn't always a prodigy destined for ballet greatness. As a teenager at the Kirov Academy of Ballet in Washington, DC, she was actually told she didn't have enough turnout or flexibilty, and was asked to leave the school. 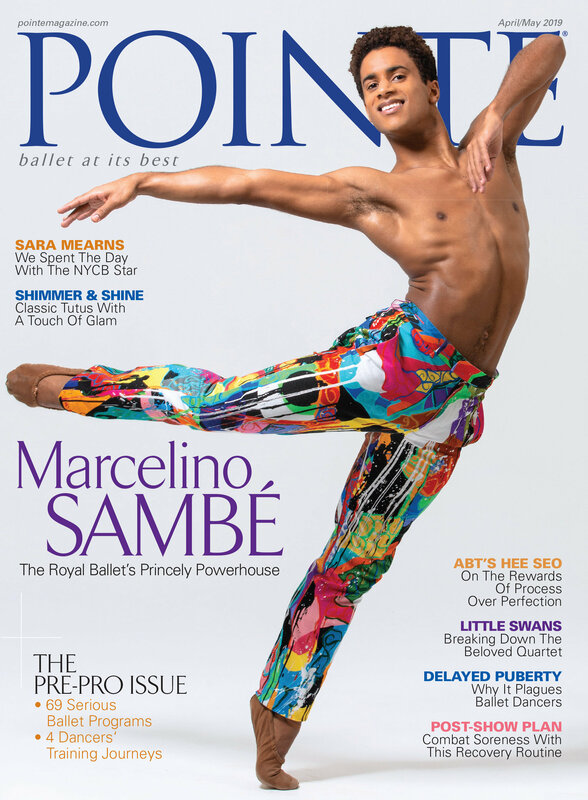 (Pick up Pointe's August/September issue, out later this month, for the full story.) But one of the Bolshoi teachers saw potential, and brought her to the Bolshoi school in Moscow. Ballet's a subjective art form. There will always be people who don't like how you dance. Womack had the chutzpah to ignore them, and through sheer will and incredible determination, she made her most fantastical dreams come true. Ballet documentaries, why are you so few and far between? We have to wait until next summer for the documentary Black Ballerina, which promises a candid discussion of racial disparities in the ballet world. And the latest buzz— Another Adventure, featuring Joy Womack—is still making the indie festival rounds, without a release date in sight. Womack was the first American to graduate from the Bolshoi Ballet's academy and the first American woman to dance with the company. She left the Bolshoi in November, 2013, accusing the company of demanding that she pay a monetary bribe to dance soloist roles. She is now a principal dancer at the Kremlin Ballet Theater in Moscow, Russia. The film features Womack's personal relationship with fellow dancer Nikita Ivanov-Goncharov, and promises to take viewers inside the world of Russian ballet. Given Womack's unique story, the controversy surrounding the Bolshoi, and the fact that she has forged her own path as an artist, it seems likely that American ballet audiences will be interested in seeing this film. Let's hope it gets broad distribution soon!